There is a smell so incredible that it triggers many wonderful memories of my beautiful island: my sister Lucy’s pasteles. Pasteles are a staple of our Puerto Rican (PR) cuisine. Simple in their ingredients but laborious to prepare, especially to those averse to cooking. Even though I have not participated in the assembly of pasteles in years, they are well worth the effort. For me, pasteles are the ultimate comfort food made of cassava or other mashed tuber vegetables stuffed with various fillings. The ingredients of our cherished Puerto Rican dish reflect the rich fusion of our culinary roots: chickpeas, olives and capers from Spain, bananas and plantains from Africa, as well as root vegetables from the Taino Indians. For Puerto Ricans that add ketchup as a topping, the more recent North American influence is also evident. 3 de mayo 2012. Yauco. Barrio Rio Prieto. Delicias de las Montañas, Inc. Proyecto de autogestion comunitaria dedicado a la confección y venta de pasteles artesanales. En la foto muestras de pasteles de guineo y de yuca. A pastel’s key ingredient is the plantain or banana leaf used for wrapping. It is clear to me that cooking with leaves is an ancient technique, still in use in Asia, Africa and in some Latin American countries, because the leaf imparts a distinct woodsy-herbal fragrance to the food. It is so distinctive that once you recognize the scent, it is as significant as savoring the bouquet of a beautiful wine. For many years, I took for granted that pasteles were something unique to Puerto Ricans but in a trip to Venezuela I was introduced to hallacas. 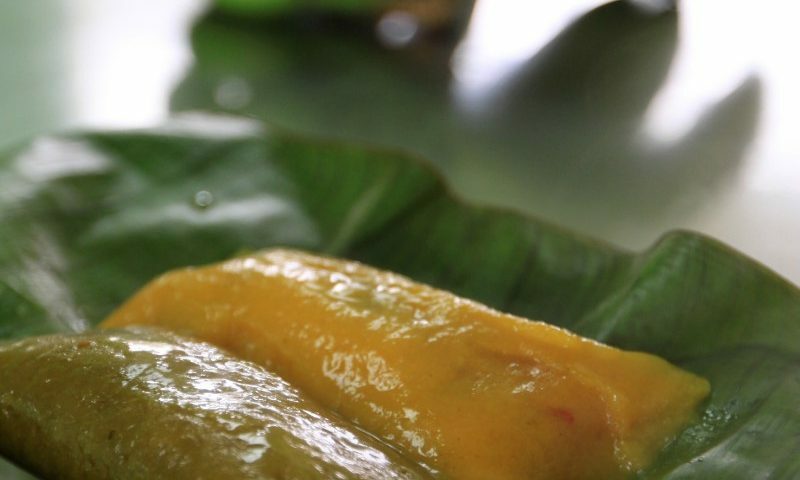 Hallacas look similar to a Mexican tamales since they are made with corn meal but the flavor imparted by the plantain leaf, used for wrapping, reminded me of my beloved pasteles. The more I thought of it, it was obvious this was a subject that would research. In doing so, I learned that many cultures have some version of pasteles, each with ingredients unique to their respective region. A bit shocked at this discovery, I asked Yaveth, who considers himself a foodie, if he ever ate pastel-like foods from other cultures. The ingenuity of people to create food from whatever is available to them is amazing. 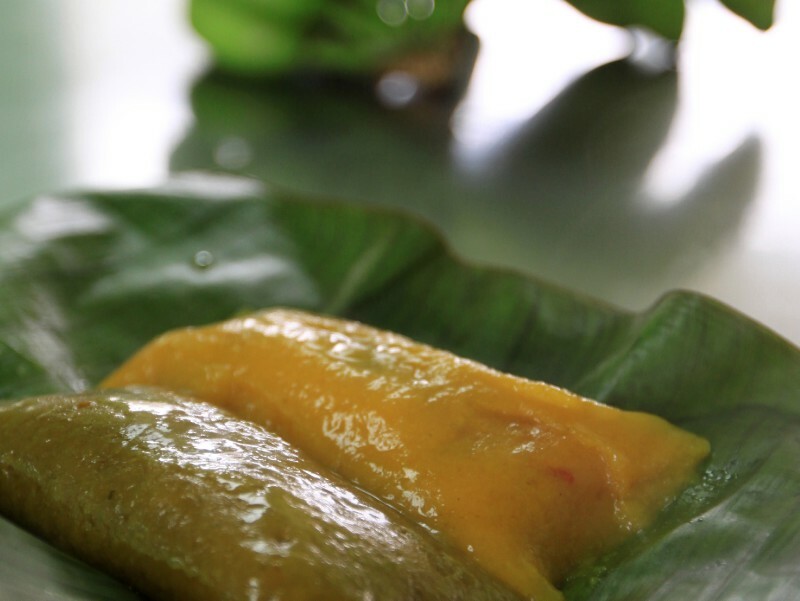 In Puerto Rico, we made our pasteles from roots, green bananas and plantains because that was often the only base materials that people could abundantly harvest due to damage from hurricanes. Before technology, cooking was an issue of survival… today it is an art form. And the humble banana leaf, originally used because it was available, is now the elegance factor of exotic dishes around the world.